This week, we join others around our great nation in commemorating Veterans Day. More than 10 percent of our 3,100 employees have served along with their brothers and sisters in the U.S. Military. We thank all 333 of them, along with all of our veterans and their families for their service and sacrifice to our country. We’re proud to spotlight two of our own for their commitment and dedication to our nation, and now to Military City as part of our CPS Energy team. They are just two examples of how our company works to hire veterans. 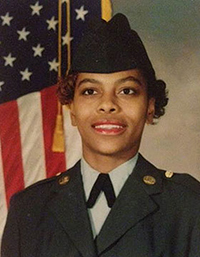 Chawana “Missy” Wilson, a scheduler at our Northeast Center, went from wearing a graduation gown to Army fatigues. She was just 18 when she was sent to Saudi Arabia in 1991 for the Gulf War. Her unit, assigned to the 114th Evac Hospital, ensured the facility’s equipment was operating properly. Occasionally, she pulled guard duty. Saudi, known for its vast desert landscapes, can be brutal. “Sandstorms would come out of nowhere, traveling at 30-45 mph. If it got in your eyes, you quickly went through an entire bottle of eyewash,” Missy recalls. Temperatures ranged from 18 degrees to more than 115. Missy served in the U.S. Army from 1990 to 1998, rising to Specialist, E-4, and earning a sharpshooter ribbon. She came to work for us in 2000. He served from 1992 to 2016 and was deployed numerous times: to Europe, the Arabian Gulf, South America, Asia and Alaska. During deployments, Jeff was the technical expert for the planning, installation and modernization for a number of multi-million dollar electronic systems; provided expertise in maintaining critical systems aboard a U.S. Ballistic Missile Defense Destroyer; and led teams responsible for navigation, radar and satellite communications. He rose to the rank of lieutenant and earned the distinction of the 2006 European Region Sailor of the Year. In 2007, Jeff was selected for commissioning as a Limited Duty Officer (LDO). “This program is highly selective,” he explains, “requiring an extensive application and selection board process that, on average, selects about 15 percent [of all eligible applicants].” He began working for our company this year. Thanks to Missy, Jeff and all veterans for their military service! Whether Army, Navy, Air Force, Marine or Coast Guard, we salute you! Scott was part of the Corporate Communications team at CPS Energy.